The VW Up is back in the lead in Denmark. Another record-breaking month for the Danish new car market with October sales up 1% year-on-year to 17.064 units, the highest ever October score in the country. This lifts the year-to-date tally up 8% to 185.534. Volkswagen frankly outpaces the market with sales up 26% to 2.489 and 14.6% share, exactly three percentage points above its year-to-date level of 11.6%. Just below, Peugeot (-1%) and Toyota (-6%) struggle, but Opel (+32%) and Renault (+29%) shine. Notice also Audi (+29%), Seat (+25%), Volvo (+32%), Jaguar (+108%), Smart (+100%), Jeep (+100%) and Land Rover (+233%) also impress. 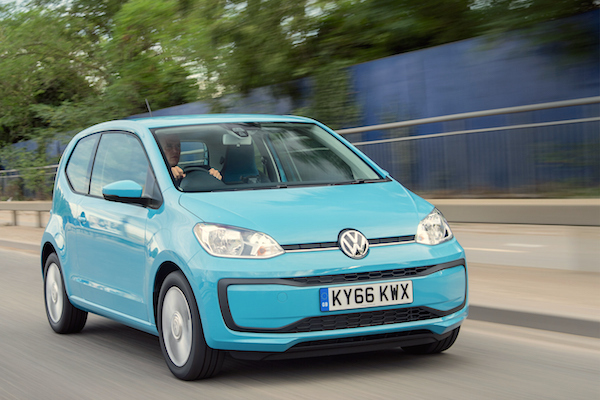 In the models ranking, the VW Up reclaims the top spot for the first time since last March thanks to sales up 22% to 879 but this is far from enough to even approach the year-to-date leadership of the Peugeot 208 at 5.902 units vs. 7.807 for the French supermini. Volkswagen even manages a 1-2 with the Polo (+31%) in second place. The Hyundai i10 (+78%), Opel Astra (+538%), Citroen C1 (+94%), VW Passat (+52%) and Kia Picanto (+78%) all post spectacular gains at the top. Full October 2016 Top 43 All-brands and Top 207 All-models below.